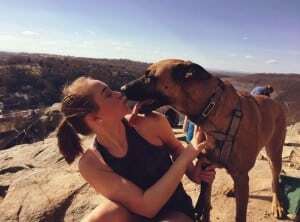 New PR and Marketing Intern – Hayley Butler - DPR Group, Inc.
DPR’s 2017 PR and marketing intern, Hayley Butler, enjoys hiking with her dog, Kaizer. DPR is excited to welcome our new intern, Hayley Butler! Hayley will work closely with our account teams to learn PR and marketing strategies and better understand day-to-day client support responsibilities. She will assist account leads with media outreach, press release writing and editing, interview transcriptions, research and social media post development. Additionally, Hayley will sit in on client meetings and strategy sessions to complete a strong, hands-on experience that will enrich her knowledge of account management. Hayley is a 2017 graduate of Shepherd University in Shepherdstown, West Virginia, where she received a Bachelor of Science degree in Communication and New Media with a minor in journalism. During her time at Shepherd, Hayley worked as the editor in chief of the University’s newspaper, The Picket. Hayley also interned for the Shepherdstown Chronicle in Shepherdstown, West Virginia, while in school. Her journalism experience has given Hayley a unique skillset that will help her excel at DPR Group and develop a career in PR and marketing. When she’s not writing or honing her PR and marketing skills, Hayley can be found lying on a beach, spending time at home with her three pups in Harpers Ferry, West Virginia, or enjoying the outdoors. She discovered her true passion for nature when she worked for two summers as a Zipline Guide at the River Riders Family Adventure Resort’s Harpers Ferry Canopy Tour. As the daughter of a law enforcement officer, Hayley grew up in Loudoun County, Virginia, training her family police bloodhound, Atlas, to find missing people for the Loudoun County Sherriff’s Office. Hayley also enjoys shopping, traveling and binge watching shows on Netflix.